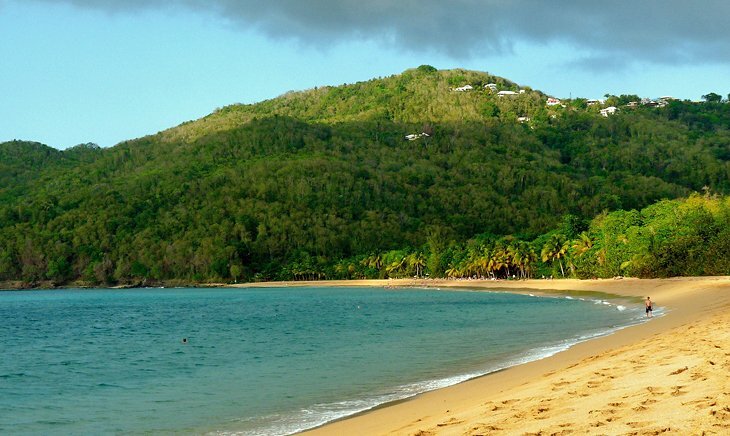 On the northeast coast of Basse-Terre, near Deshaies, Plage de Grande Anse is a picturesque slice of palm-lined sand and clear waters. Flanked by lush headlands, the beach stretches for more than a kilometer, with soft golden sand and plenty of shady trees. It’s a wonderful beach for a stroll, and the waters are usually great for swimming, although the surf can be a little rough on windy days. It’s not the best place for young children to swim, as the sea floor drops off suddenly beyond the shoreline. A bonus here is that you can rent kayaks to paddle around the mangrove-fringed lagoon behind the beach. After a morning of sunbathing and swimming, head over to the little cafes and food trucks near the parking lot, which sell mouthwatering crepes and other snacks.